My mom snapped a picture of her recipe card for me – typed on a script typewriter by her mom. My mom’s notes are pencilled in. Don’t you just love that? These cookies have been part of a lot of Christmases! First, you need finely chopped pecans. Growing up, we had a handy little nut grinder like this, and I loved turning the crank and watching the measurement line to get just the right amount. Alas, I had one of my own and purged it before one of our (7 in 8 years) moves. This is why I hold onto things! Because of this kind of remorse! So now I have to chop up my pecans by hand…but it’s still oddly satisfying and enjoyable. You want a pretty fine chop – I wasn’t done in this picture – so the dough stays together when you roll it! The dough is really simple: butter, powdered sugar, vanilla, salt, flour, and nuts. I’m an unashamed cookie dough taster, but last Christmas I was pregnant – so I ate extra, extra Russian Tea Cookie dough since it doesn’t have eggs! Go easy on your flour measuring so the dough rolls easily (mine was a little dry this time). Roll the dough into balls. Since there’s no baking soda or baking powder, the cookies will stay whatever size you make them (this also means they can be pretty cozy on the baking sheet). I always make them a little too big – the powdered sugar coating:cookie ratio is best when the cookies are small! My helper was really good at shaping the cookies! The cookies are done when they’re just getting brown. This is when the magic happens – they get their first roll in powdered sugar when they’re still warm from the oven, and it melts a little and creates an icing-y layer with the toasty outside of the cookie. The second roll happens when they’re cool, and gives them a powdery dusting. These are so, so tasty! And so easy to pop into your mouth every time you’re in the kitchen, even if you’re sneaking around since you just told your child they couldn’t have any more. Ahem. Just watch out for the powdered sugar snow on your shirt! If you make something called a tea cookie, be prepared to have lots of tea parties! Cream butter and sugar. Add vanilla, flour, salt, and nuts and mix until dough comes together. Shape the dough into small balls and place on a parchment-lined baking sheet. Bake for 12-15 minutes until beginning to lightly brown. 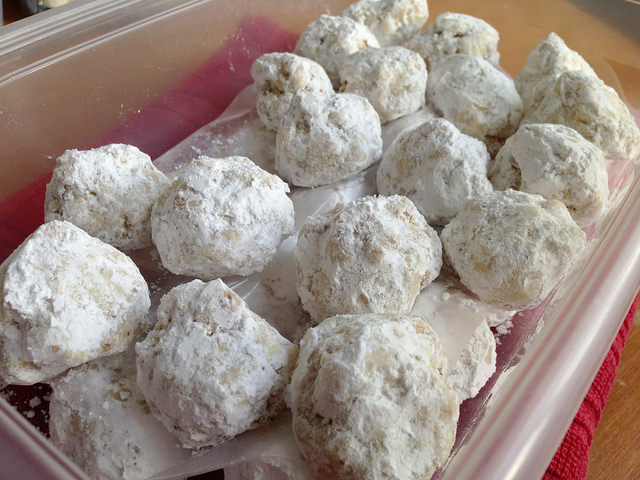 While cookies are still warm, roll in powdered sugar. After cooling, roll them again. This recipe is from my Mammy – my mom’s mom. I just noticed that on the recipe card my mom (Mammy) wrote that the single batch makes 9 dozen. I wrote that the double batch (and you always need to make a double batch!) makes 8-1/2 dozen. She wrote “roll into dime-size balls”, and she really did that. I penciled in “larger”, which apparently really means “twice that big”! Either way, these are delectable!